By studying liverworts – which diverged from other land plants early in the history of plant evolution – researchers from the Sainsbury Laboratory at the University of Cambridge have found that the relationship between plants and filamentous microbes not only dates back millions of years, but that modern plants have maintained this ancient mechanism to accommodate and respond to microbial invaders. Published in the journal Proceedings of the National Academy of Sciences, a new study shows that aggressive filamentous microbial (fungi-like) pathogens can invade liverworts and that some elements of the liverwort's response are shared with distantly related plants. The first author of the paper, Dr Philip Carella, said the research showed that liverworts could be infected by the common and devastating microorganism Phytophthora: "We know a great deal about microbial infections of modern flowering plants, but until now we haven't known how distantly related plant lineages dealt with an invasion by an aggressive microbe. To test this, we first wanted to see if Phytophthora could infect and complete its life cycle in a liverwort. We found that Phytophthora palmivora can colonise the photosynthetic tissues of the liverwort Marchantia polymorpha by invading living cells. Marchantia responds to this by deploying proteins around the invading Phytophthora hyphal structures. These proteins are similar to those that are produced in flowering plants such as tobacco, legumes or Arabidopsis in response to infections by both symbiont and pathogenic microbes." These lineages share a common ancestor that lived over 400 million years ago, and fossils from this time period show evidence that plants were already forming beneficial relationships with filamentous microbes. Dr Carella added: "These findings raise interesting questions about how plants and microbes have interacted and evolved pathogenic and symbiotic relationships. Which mechanisms evolved early in a common ancestor before the plant groups diverged and which evolved independently?" Dr Sebastian Schornack, who led the research team, says the study indicates that early land plants were already genetically equipped to respond to microbial infections: "This discovery reveals that certain response mechanisms were already in place very early on in plant evolution." "Finding that pathogenic filamentous microbes can invade living liverwort cells and that liverworts respond using similar proteins as in flowering plants suggests that the relationship between filamentous pathogens and plants can be considered ancient. 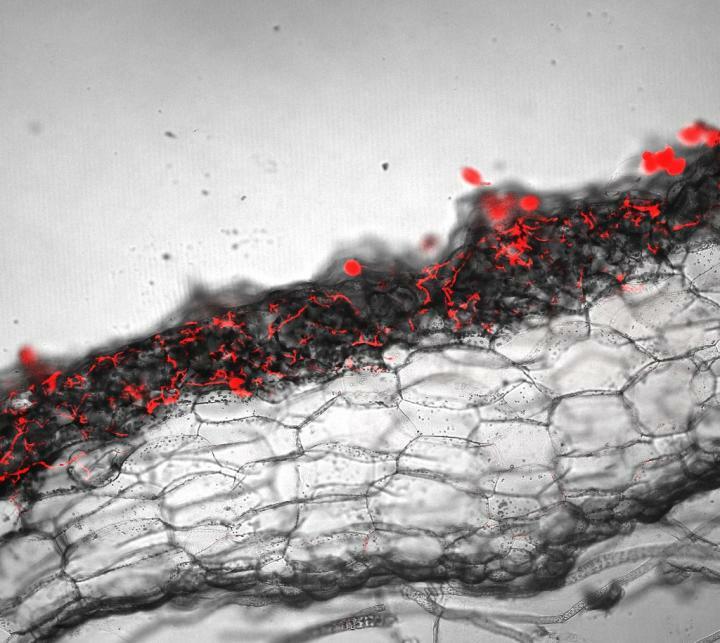 We will continue to study whether pathogens are exploiting mechanisms evolved to support symbionts and, hopefully, this will allow us to establish future crop plants that both benefit from symbionts whilst remaining more resistant to pathogens. "Liverworts are showing great promise as a model plant system and this discovery that they can be colonised by pathogens of flowering plants makes them a valuable model plant to continue research into plant-microbe interactions." Liverworts are small green plants that don't have roots, stems, leaves or flowers. They belong to a group of plants called Bryophytes, which also includes mosses and hornworts. Bryophytes diverged from other plant lineages early in the evolution of plants and are thought to be similar to some of the earliest diverging land plant lineages. Liverworts are found all over the world and are often seen growing as a weed in the cracks of paving or on the soil of potted plants. Marchantia polymorpha, which is also known as the common liverwort or umbrella liverwort, was used in this research.